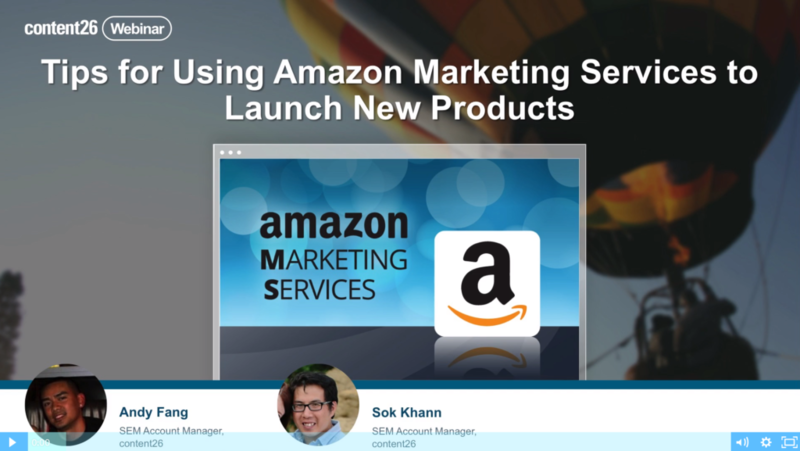 In this Amazon Advertising webinar, content26 SEM Account Managers Andy Fang and Sok Kahn outline tips for using Amazon Advertising to launch new products. They cover everything from basic steps like committing adequate resources and ensuring ads link to high-quality product pages, to detailed hypothetical scenarios for new product launches. Each type of Amazon ad is covered, offering an in-depth look at how Sponsored Product ads, Sponsored Brand ads, and Product display ads can be used to make your new products stand out. Download the webinar for a step-by-step breakdown of how to use the different Amazon ad types to get new products up and running effectively. Note: On September 5, 2018, Amazon rebranded its advertising platform. Amazon Marketing Services changed to Amazon Advertising and Amazon Advertising Platform changed to Amazon DSP, among other changes. This webinar was created before Amazon rebranded. Sok joined content26 in 2016. He brings six years of digital marketing experience working for both agency and in-house marketing teams. When he’s not thinking about new ways to increase ROAS, he keeps himself busy by trying to keep up with his toddler, Juniper. In his free time, he enjoys reading about local concerts that he didn’t attend because he no longer has the energy to stay up past 9.00 p.m.
Andy joined content26 in 2017. He came to content26 with over 5 years of experience in Digital Marketing & eCommerce. Outside of managing brands on Amazon.com, he enjoys going to live shows, wasting money on sneakers, and travelling the world.